Las Vegas (June 14, 2018) – With more training courses and certification opportunities, added technology offerings, expanded marketing and lead generation programs, and a myriad of networking options, Travel Leaders Network is cementing its competitive position as the travel agent network of choice. More than 40,000 travel agents within the U.S., Canada and internationally are now part of Travel Leaders Network and are reaping the advantages of the organization’s huge array of benefits, programs and negotiating power. Additionally, Travel Leaders’ new relationship with American Express further heightens agents’ opportunities to earn more and provide an expanded menu of services to their customers. 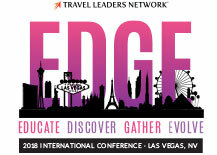 All of these announcements, highlights and more are being showcased during the organization’s 2018 international conference, EDGE (Educate, Discover, Gather, Evolve), which takes place through June 16 at Caesars Palace in Las Vegas. The number of Travel Leaders Network agents actively involved in the organization’s six specialist programs has risen to 1,612 and increases each month. Those programs range from leisure travel, business travel, group travel, luxury travel, honeymoon and destination weddings, and active and adventure. More than 374 agents have graduated from the programs. Overall, the network offers over 500 training opportunities to its member agents throughout the year. Within Agent Profiler, which is a free benefit for Travel Leaders Network agents that provides consumers direct access to travel professionals via TravelLeaders.com, nearly 5,500 agents are now displaying online, representing expertise in 135,000 destinations and 53,000 interests. Through the end of May, organic traffic to TravelLeaders.com was up 45 percent year over year and leads flowing through Agent Profiler continue to grow significantly. Driven in large part by the company’s unique content management and Search Engine Optimization strategy, an estimated 140,000 leads are anticipated for the full year 2018. The average sale on leads generated through Agent Profiler is currently in excess of $5,000. Travel Leaders Network is offering more than 300 hosted sailings this year across nine premium and luxury suppliers as part of its Distinctive Voyages program. Each of these cruises features a host, private cocktail reception, and complimentary shore excursion. Additionally, within Distinctive Voyages is the Car & Driver program, which was first introduced last year and has proven hugely popular. The number of participating cruise lines has doubled to six. These luxury cruises feature the use of a private car and driver in a port of call. Also, in 2018, Travel Leaders Network is offering approximately 100 cruises as part of its Culinary Collection, many of which feature all the benefits of Distinctive Voyages along with a special culinary feature such as a meal in a specialty dining venue or a wine package. Beyond those programs, there are an additional 3,500 cruises available through Travel Leaders in 2018 that offer special amenities such as a shipboard credit, pre-paid gratuities, specialty restaurant meal or wine package. There are now 17 different cruise lines partnering on the program, ranging from contemporary, premium and luxury to river cruises and adventure voyages. Travel Leaders also recently introduced a new website www.buymytravelagency.com that matches owners who are interested in purchasing other agencies with prospective sellers. Potential agency buyers can purchase a display ad describing their existing business, the types of agencies they’d like to acquire, geographical parameters and other requirements. Selling parties can review the ads and connect via the website with potential purchasers.